This article shows how cultural practices can promote human trafficking. The U.N. Children's Fund UNICEF estimates that 1.2 million children are trafficked every year into what it calls "the modern-day equivalent of slavery". This trafficking takes many forms in West Africa, encouraged by a tradition of "placing" young children with families of wealthier relatives to receive an education or learn a trade. "It's a high-risk practice," said Serigne Mor Mbaye, a staff member of U.S.-based non-profit development agency Plan International. "Many of those who are placed are victims of abuse. This traditional practice continues to happen, but (social) solidarity does not function like before," he said, adding that many children are placed these days with unrelated strangers. The Plan research in Togo found most trafficked children went to Nigeria, girls generally as domestic servants and boys working in agriculture, markets or serving food. Different types of child trafficking networks have sprung up in other parts of West Africa. 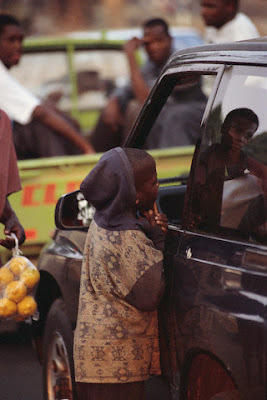 Police in tiny Guinea-Bissau uncovered a trafficking network last week when they found over 50 young boys headed to Senegal, where hundreds of children sent from neighboring countries to attend Koranic schools end up begging for coins on street corners. The child trafficking debate has been revived by the arrest last month in Chad of French humanitarian activists on child kidnapping charges over a bid to fly 103 children to Europe. The children were presented as orphans from Darfur, even though most turned out to be from villages in the Chad/Sudan border area and had at least one living parent.